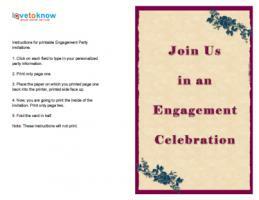 Templates create beautiful engagement invites. 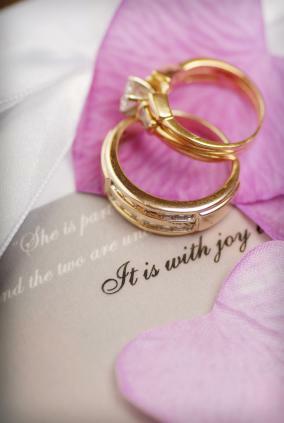 Engagement parties are a lovely way to celebrate upcoming nuptials with family members and friends. The party gives families the opportunity to meet in relaxing circumstances before the wedding and can often be the first time that members of the family meet the future husband and wife of a loved one. The invitations used for this event should be ones that reflect the couple's personality, while marking the occasion and keeping them on track with their entire wedding budget. 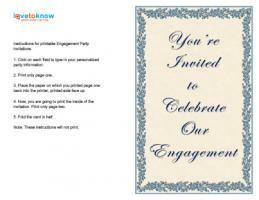 When organizing the engagement party, one of the first things to do is to plan the engagement party invitations. 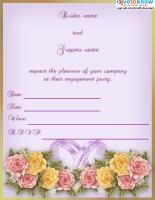 The invitations will tell everyone where and when to meet and give other important information as required. The invitations need to hold certain pieces of information and while it is possible to communicate this via the telephone or email, most couples enjoy preparing and sending invitations. 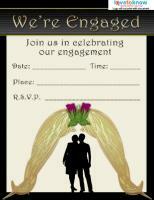 Engagement invitations can be long cherished by family and friends and make lovely, lasting keepsakes. If a couple is looking to create unique invitations or to save some money, free engagement invitation templates are good choices. To use the following templates, simply click on either the photo thumbnail or the linked words. After the invitation loads, decide if you are going to fill the template in online or if you want to save it and print it later, filling in the pertinent information with your own handwriting. If you need help downloading the printables, check out these helpful tips. 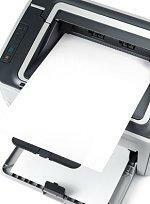 Card: Choose the best card for both the occasion and your printer. Thick, textured cardstock may not produce quality images and may jam. Instead, look for a nice quality, lightweight cardstock with a smooth surface. Remember to pick up matching envelopes that will fit your final invitation card size. Pen and ink: A very basic invitation can be transformed by the use of a good quality pen and ink. A blotchy ball point pen will give a poor impression whereas a text written in a fountain pen will look professional without losing the handmade touch. Alternatively, make use of the option to fill in the template information online or on your computer. This eliminates any smudging, poor handwriting worries and allows you to create multiple copies with the push of the "print" button. Embellishments: A few simple embellishments, such as ribbon in a color that coordinates with the rest of the wedding décor or perhaps a couple of decorative rings, will give an added dimension to the invitations. This can be a good way of transforming otherwise plain and simple invitations. Suitable embellishments are readily available from craft stores. Free templates can be the perfect way to produce lovely engagement invitations while also retaining full control and saving money, giving any couple a great start toward their future together. 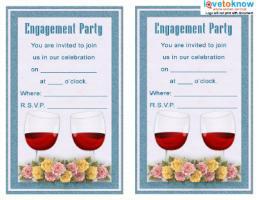 The templates are perfect for couples who are looking to create their own invitations with ease.